Our product range includes a wide range of copper annealing furnaces. We are the leading manufacturers of Copper Annealing Furnaces. 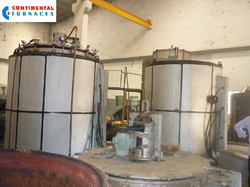 Generally, Annealing of Copper is done on 300-400 C. Hence furnace is suitable to attain temperature around 600 C. Vacuum Pots are provided with a furnace with a vacuum pump.